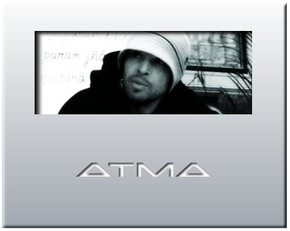 Atma recorded his first EP in 1999 with Chicago-based producer, Panik from the Molemen production group. In 1997, he became a spiritual seeker after having a near death experience. In 2000, he became a monk, and studied with various spiritual teachers until 2005. Afterward, he contacted Panik again and recorded the now underground classic LP Beyond the Speed of Mind released in 2006, which in 2009 was released officially through Nod Records as Beyond the Speed of Mind - Reincarnated. Along with Apakalypse and Jahnigga the Baptist, Atma formed the supergroup Masta Buildas in 2007 and released the LP Reptilian Dody Snatchas in 2009. Later that year, Atma recorded Beyond Birth and Death, which was released through LCOB productions in February 2011. In late 2011, he joined forces with TrustOne, to make up the formidable Jewelz Infinite.